When we first got to know William Bruce late last year (MUF 2012, 4th Quarter issue) it was clearly apparent that he values people. The COO of American Fork, Utah-based Abundant Brands values his family, customers, his employees, and those in need in his community. His dedication to these important groups of people is one of the reasons he was selected as Multi-Unit Franchisee magazine's Noble Cause MVP Award winner for 2013. Bruce remains dedicated to his company and the empire of more than 250 Subways and 16 Costa Vida Mexican Restaurants...and The Rescue Missions of Salt Lake City. Together they distribute the excess rice, beans, pork, tortillas, and other food flavors into a seven-layer burrito dish. 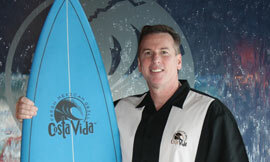 These days, the regular delivery of 400 meals is known on the streets as "Costa Vida Thursday," says Bruce. In 2013 they added another community value called "Subway Tuesday." "We added another weekly day for our hungry person. We now take the left over flavored Subway breads, and produce open faced hot tasty sandwiches weekly. The kids who make tortillas and baked breads, feel good knowing the extra is feeding the hungry." His "do good vibe" permeates every facet of his organization. And he credits his wife Tali, who is director of marketing for Roxberry, as being his greatest partner and supporter. Abundant Brands also includes Roxberry Juice Co., Big Al's Bar-B-Q, Craig Cuts Salons, and the Utah Blaze arena football team. He says he has all kinds of fun times with the Blaze. "This past month, we rode out to midfield with our flamed chopper roaring, bringing fans to their feet and cheering the Blaze team on," he says. This self-described operating philosophy of "good and human progression," or "good vibrations," is fitting for a guy who grew up surfing every day in Southern California and whose parents owned a consumer marketing company that rated restaurant quality and service. Bruce has been in the foodservice business a long time, starting out by tossing pizzas at a beachside restaurant when he was 16. His restaurant experience also includes top leadership roles with Paradise Bakery & Cafe, Souper Salad, and Souplantation & Sweet Tomatoes. He's been with Abundant Brands since 2008. His recipe for success includes his belief in strong operational systems, checklists for all facets of a restaurant, and hiring and training the best people. "My main thing is loving our people," says Bruce. "We hire great people with the same vibration I have, that our company has, and our culture has. We have low attrition, and that is a win for us in all our restaurants." When the father of five is not working he is an avid reader who counts snowboarding, date night with his wife, watching his kids' sports, and cleaning house among his hobbies, and he still has his "toy:" a Big Dog K-9 custom chopper complete with flames on the tank and tail. Family: Beautiful wife Tali; five teenagers: Austin-serving a Mormon mission in South Korea. Baron-6'4'' 300 lbs. 17-year-old all state Jr. at Alta High. Kai- our 8th grade mathematics prodigy. Oldest daughter Kelby at age 17- graduated with honors from HS, with her Associates and earned a scholarship in Physics at USU. Kenzie now 17; is our dancer, drill team, and 3.9 GPA Senior. We have some family pride. I feel teenagers at home, are what makes managing these young adults at work, so much fun. Michael Mack, CEO of Souplantation/Sweet Tomatoes. He always offered self-improvement seminars: "Taking Responsibility," "Leadership Career Stoppers," and such. These events proved to be worth every moment. No regrets; for me the real question is "What did I learn from poor decisions?" These "business stoppers" happen. What I learned: Do not make the same mistakes. Remember and learn from them. Leaders who enjoy learning and can change with age are better performers. Delivering the company vision; finding people doing their jobs better than I ever could. When I work behind a counter, I always tell the guest: "I am here slowing down the line. These folks are the fast and efficient ones!" Date nights, kids' sports and living kids' successes, surfing, snowboarding, personal journal update writing, and you won't believe this (my wife will concur) I love cleaning house and shining shoes. I am a heavy magazine reader: Multi-Unit Franchisee magazine, QSR, Surfer, Snowboarder, (Ideas & Discoveries), theology. I love the Internet for fast reads and topics. I started again the book Blink by Malcolm Gladwell. This book articulates the way I make choices. When it came to restaurants, Vern O. Curtis, who in the 1980's, led Denny's and its subsidiaries as the CEO drove home: "Location, location, location, for restaurant success!" My passion is being "Plugged-in" so that when someone approaches you, you're ready before they ask. Can a leader be this advanced and ready, before any problem can arise? I believe leaders like this exist and they are always "on their restaurant/business/personal game." I feel balance is everything; family time, healthy outlook, work duties, husband "honey-do" lists, spiritual experiences, helping our community are all essential. There is probably more, but balance is "key" to loving your life. We do love our life, and strive to expand our help to others. There is nothing like a fishing trip. We had a grandpa who built a cabin in Yellowstone around 1920, by himself. His honeymoon was in this cabin. It took him three days to travel there from Salt Lake City with his bride. Now we get two weeks a year from our non-updated, spider infested, mattresses on the floor shack. And the fishing is like having them in a barrel. My sons and I will never give up this fishing hole! When associates ask: "Can you do this?" and your experience says you know how; always speak up and say, "Yes, I can!" Following. I have a competitive drive to be first down the ski mountain, ride the biggest waves, be first on the bus for more seat choices, and lead teams to always win. Innovation keeps people moving. Rarely do I say "Do it like this!" Innovation means asking your folks "How would you do this?" Now you are working as a team; synergizing. You may have the right answer but, with all input, the idea may develop into a brand builder. Very close. There is not a cash register in the home office. No money being made there! What do you rely on/expect from your franchisor? What I need from vendors? Nicholas & Co. and their executive leaders like Craig Romney (corporate sales executive, UT) create open communications; now if you have a problem, the channels to talk are open. Vendors play a significant role in all restaurants. We utilize Facebook and others. I believe social media was really big in 2009-2010. We have begun to see slumps. Perhaps the Facebook IPO is drowning our Facebook love. Our Costa Vida and Roxberry brands get laughs on YouTube with "Mr. Costa Vida" & "Dr. Roxberry" videos (I am the star--take a peek!) We play these during our Utah Blaze arena football games on the NFL channel. We get a lot of comments from these spots on cable TV, even though they are really designed for social media. In hiring and terminations, I feel company culture can have a vibration of good and human progression. When people are being interviewed, you want to feel they vibrate at the same level as you and your organization. When employees are demonstrating something other than great performance, they vibrate themselves out; they really fire themselves. Being a leader; being "plugged-in" helps you recognize these behaviors and vibrations and inspire growth. Saying "It's done" when it's not. I will always follow up. Therefore, be your word. Utah Subways and our other brands about $50 million. Growth. Now is a great time. Good deals are around. Profitability, other results, our culture being lived, having good relationships with team members and franchisees, and life balance. Owning. Mentoring and helping managers become better people is always my goal. We are steady in Utah. The housing market has really increased in the past year. We will stay ahead of competitors. The economy is always up and down. Verses flying in coach, I want to be flying in "First Class" with service, food quality, and fresh ideas. We'll let competitors look through the drapes separating us, have them wondering what is going on in that first class company we're running. Let them see we are always "Top Shelf." The difference: they can come in, experience it, use the bathroom, etc., however, we always forecast to be the best. Where do you find capital for growth/expansion? Investors, our current bank relations, and from our own profits. I always have a New Year goal-setting seminar and mid-year we do awards. Bonus potential is available and we have an open-door policy if a team player needs help. I feel that one-on-ones with an executive team member is always a win for crew and us alike. Always take time with employees in the business atmosphere; they watch us closely. The best we can. Hurdles always come. Certainly we can overcome obstacles that arise. What an awesome idea that all Americans can have healthcare. I am not the biggest supporter of government programs, ideas, and small business government controls. However, to offer medical attention for our country's populace, feels right within me. How do you reward or recognize top-performing employees? We have many items to reward on. Results are measurable. We have Mindshare (guest feedback program at Costa Vida) and Evaluators who measure operations and every aspect (Costa Vida and Subway). Rewarding is made simple with these tools. We always have holiday parties and monthly manager meetings. In management meetings, if something really cool came up that month, we let all the managers know and single out that manager for great performance and a job well done. If the manager has a great idea and we as a group run with it, recognizing them is very important. Why do you think you were recognized for the "Noble" award? I have the best cheerleader. Her name is Tali Bruce. Your spouse can be your best asset. When you recognize this, you begin to grow and understand you "married up." I have loved building a delivery system to feed the Rescue Mission guests. However, Tali explained another improvement idea. Instead of waiting for a holiday to help the less fortunate, each of us should do this on our birthday. Now that is a Noble Challenge. In 2008, when I came on board, the company's multi-branded units were dealing with a low percent cash flow. Today, we crush this number by more than 10 percent. Engaging the hard working people, adding systems, new brands, empowering each crew member and lowering attrition have been key. Give an example of innovations you have created and used to build your company. 1. The centralized kitchen for the Costa Vida Brand has shown tremendous added value and is now an added profit center servicing other franchisees in the state. 2. Playing humorous characters with Dr. Roxberry, Mr. Costa Vida on You Tube has been fun, and these have turned into commercials on the NFL channel for our AFL team. 3. Teaching and engaging managers, has allowed them to create win-win environments. If leaders stood tall and said "Everyone you are Empowered." Now everyone is innovating. What core values do you have that you feel led you to winning the MVP Award? Be your word. I feel this is the highest value in America. Like the Greek word "Filotimo," which is "Friend of Honor," regarded as encompassing all values. When you deliver on your commitments, your teams vibrate and deliver in the same way. Explain the role of community involvement to you and your company. We deliver fresh food to our Costa Vida restaurants each day from the central kitchen. I set up the restaurants and kitchen to bring back the food that was left over and slated for waste from the night before. Each week I have the kitchen make 250 pounds of seven-layer burrito. We change the flavor each week. We then deliver and feed about 500 less fortunate folks at our Salt Lake City Rescue Missions. On the street, "Costa Vida Thursdays" is happening. We have been doing this for 18 months now. Our newest street name in Salt Lake City: "Subway Tuesdays." We started the first week of 2013. We take the leftover, flavored breads from 3 downtown Subway locations. Weekly changes include: open-faced, beef gravy sandwiches (my favorite), toasted pizza breads and garlic cheese breads. The mission serves these hot each week; about 250 sandwiches. Combined, we now serve over 750 guests weekly in the many Rescue Missions of Utah, with leftover foods from two brands. With this system, "I thank my life for these helping moments." What are the important leadership qualities to you and to the members of your team? I know a tenured leader can walk into a room, understands the people there, recognizes their talent, and then creates scenarios within the team that benefit everyone in their circle of influence. My hope one day is perfecting this leadership energy!